Feeling confident in your smile can help open doors for you socially and professionally. If you’re unhappy with your smile, cosmetic dentistry may be able to help. At Houstonian Dental, our talented dental team provides a variety of cosmetic treatments to help you achieve the smile of your dreams. From simple teeth whitening to complete tooth replacement, we can address a variety of dental imperfections. Want to find out more about what we can do for your smile? Give us a call today! What Cosmetic Dental Services Do You Offer? What Does Cosmetic Dentistry Fix? Nearly any aesthetic issue with your teeth can be addressed by cosmetic dentistry. In many cases, you have multiple options for correcting the problem. Whether it comes down to the color, shape, or spacing of your teeth, it’s simply a matter of choosing the best solution for your unique case. How Do I Decide Which Cosmetic Treatment I Want? When you visit our practice, we listen to your aesthetic goals to get a general idea of what you hope for with your smile. We then perform a complete exam of your smile to help us understand the particular issue and your overall health. Once we have a better idea of your smile, our dentists provide recommendations on what can be done. We take the time to answer any of your questions and explain each option in detail, so you feel informed about your choices. We also have several sample or trial methods to show how certain treatments will change your smile, which can help to make your decision clearer. How Will My New Smile Look? Our goal is to help your smile appear natural, healthy, and flattering to your features. When planning your treatment, we take several factors into consideration. These include the natural color of your teeth, your facial structure, the shape of your mouth, even your skin complexion. We apply an artistic eye at every step, making sure the design, fit, and placement is ideal. It’s common for teeth to become stained over the years. Depending on the cause of your discoloration, teeth whitening may be able to help restore your smile to its natural color. How Did My Teeth Get Stained? In most cases, years of exposure to dark food and drink – like coffee, soda, berries, or spaghetti sauce – leaves yellowish stains beneath the enamel. Tobacco use is also known to cause stains. Teeth whitening penetrates the enamel to break up these stains, revealing the natural enamel color underneath. Other factors may also cause staining, including illnesses, medications, and damage to the teeth. Teeth whitening may not be effective on these stains, and a different cosmetic treatment may be needed. The dentist will work with you to determine the cause of your staining before recommending a whitening treatment. 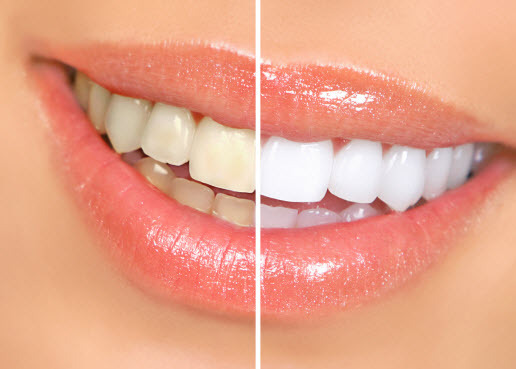 Teeth whitening in a dental office uses a specially formulated bleaching gel to lift set-in enamel stains. This gel is significantly stronger than over-the-counter bleaching products, allowing teeth to become several shades brighter in a single visit. The dentist can also craft a custom whitening tray designed to fit your specific teeth, resulting in more even whitening across every tooth. Want Your Whiter Smile to Last? These 5 Tips Might Help! How Can Veneers Help My Smile? Color – The tooth-colored shells completely conceal your natural tooth enamel, hiding any discoloration. Size and shape – Veneers can cover chips, fractures, and teeth that are small, worn, or oddly shaped. Alignment and spacing – With the right artistic approach and placement, veneers can disguise gaps between teeth or teeth that are mildly crooked. First, the dentist works with you to discern which of your teeth will receive veneers (usually the front 6-8 teeth on the top arch). The dentist designs your veneers to provide a flattering appearance while still looking natural in your smile. Trial or temporary veneers may be used as part of the process to give you a preview of the results. Once the veneers are ready, a thin layer of enamel is removed to make room for the veneers. They’re attached with dental cement, and then your new smile is complete! Do Veneers Damage Your Teeth? While some enamel does need to be removed for veneers to be placed, the inner tooth is unharmed. The new veneers essentially become a part of your teeth, protecting them from dental damage. Veneers are durable, stain resistant, and effective at concealing issues, but they may not suit every situation. Whether veneers are right for you will depend on your unique circumstance. In general, it’s advised to use veneers on the front teeth only, as constant chewing force may damage or dislodge them. Any dental health issues, such as cavities, must be addressed before applying any cosmetic treatments. Also, keep in mind that veneers are matched to the shade of your smile, and cannot be whitened once placed. It’s recommended that any teeth whitening be done before veneers are placed. Are Composite Fillings as Good as Metal Fillings? More and more patients today are opting for composite fillings. Made of tooth-colored resin, these fillings blend in seamlessly with your natural enamel. But do they hold up against metal fillings? Consider these benefits of composite fillings to decide for yourself if they’re right for you. Aesthetics – Composite fillings blend in perfectly with your natural tooth. Preservation – Composite resin bonds to your tooth enamel, so the dentist doesn’t have to remove as much enamel to place the filling. Comfort – Metal fillings sometimes conduct heat and cold, causing discomfort; composite fillings don’t. Safety – Composite fillings are 100% free of mercury and other metals. The main drawback to composite fillings over metal is that metal fillings currently last longer. However, composite materials continue to get better each year. On average, a composite filling placed today will last fifteen years or longer with proper care. Should I Get a Porcelain Crown? Porcelain crowns protect your teeth while also maintaining your beautiful smile. The color of the crown is matched to your surrounding teeth, and it looks and functions just as your natural tooth would. When are Porcelain Crowns Used? If you have a single tooth that’s chipped, cracked, or discolored, the dentist may recommend dental bonding. The dentist shapes a putty-like material to the tooth, which hardens and completes the tooth to restore its appearance and function. Bonding can also be used to fix minor cosmetic issues like gaps between the teeth. Can Invisalign® Straighten My Teeth? To determine whether you are a candidate for Invisalign, the dentist evaluates your alignment. A majority of misalignment cases can be helped with Invisalign. If you have severe or complicated alignment issues, however, metal braces may be more appropriate. How is Invisalign Different from Metal Braces? 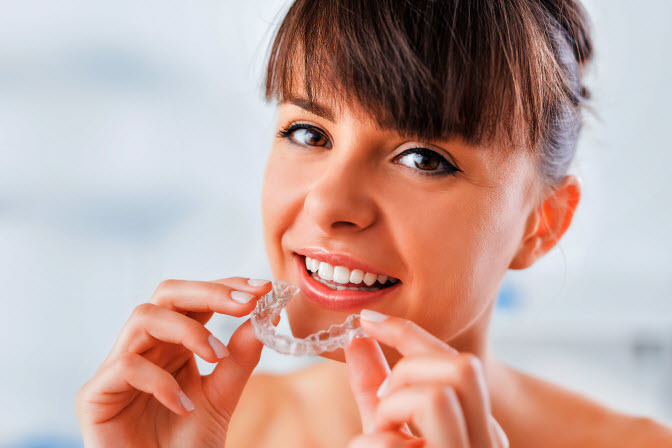 Invisalign clear braces use a series of clear trays to guide your teeth gradually into proper alignment. These trays are customized to your teeth using 3D imaging technology, ensuring a snug and effective fit. While metal braces shift teeth through tension, Invisalign uses targeted pressure to move them. Invisalign trays are also much thinner and feel more natural than metal braces. The trays are removable and can be taken out for eating or brushing your teeth. With Invisalign, you can enjoy a variety of benefits as your teeth become straighter. Discreetness: The clear aligners fit neatly to your teeth and are almost invisible. Comfort: With no metal attachments, the aligners feel like your natural teeth after a quick adjustment period. Removable: You can take out the aligners to eat, drink, or brush your teeth. Safe: No protruding metal means less risk of injury during sports and other activities. Have more questions about Invisalign? Take a look at these common questions. If you don’t see what you’re looking for, please don’t hesitate to reach out to our office! How Long is the Invisalign Process? The duration of your treatment depends on your unique situation. On average, it takes between 6-18 months. Each aligner tray is worn for two weeks – the more pronounced your misalignment, the more trays you need to achieve results. Some patients may be able to accelerate their treatment by changing trays every week. Talk to the dentist to find out if this option is right for you. Do I Have to Wear the Aligners All the Time? You’ll need to wear the trays for at least 22 hours a day to ensure good results from your treatment. We recommend wearing them whenever you aren’t eating a meal or brushing your teeth. It’s normal for teeth to be sensitive after switching to a new aligner. For most people, the soreness only lasts a few days, after which your teeth feel normal again. You can take an over-the-counter pain reliever to help with the sensitivity while your teeth adjust. Does Invisalign Affect My Speech? It can take a little time for you to get used to having the aligners on your teeth. Your speech might be slightly affected as your tongue adjusts to the added thickness. These should go away on their own as you get comfortable with them. Are There Foods You Can’t Eat with Invisalign? With Invisalign, you can eat whatever foods you like. Simply remove the aligners before you eat, then enjoy your meal! You will need to brush your teeth afterward, though; most people find that they eat fewer snacks while using Invisalign. Can I Smoke with Invisalign? It’s advised that you refrain from smoking during your treatment. Tobacco leaves brown stains on the aligners, making your teeth appear dirty or unhealthy. It also increases your risk of gum disease, which negatively impacts your treatment and can lead to bone and tooth loss. Discover Your Best Smile Yet! The skilled team at Houstonian Dental is passionate about helping our Houston community enjoy healthy, beautiful smiles. Give us a call today to find out what we can do for you!